Could a convicted felon who did federal prison time convince the voters to elect him to a seat on the Cook County Board? 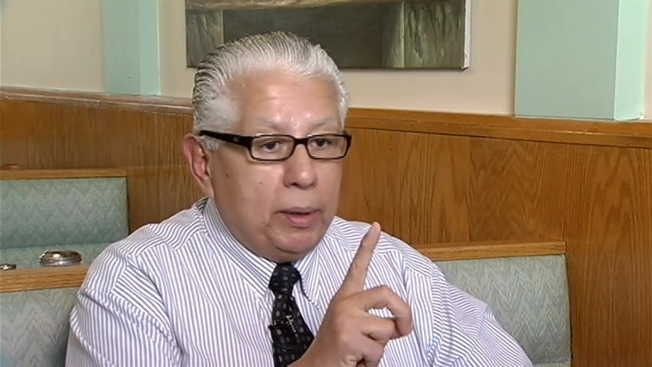 In one of those, "only-in-Chicago" scenarios, Sanchez, the former Chicago Streets and Sanitation Commissioner, is running for the seat in the County's fourth district. He may have done two years in prison for a hiring scheme from his city days, but he says he is confident the voters know he did nothing wrong. "There was no money involved," he says. "I got no personal gain from this whole situation." The former Streets and Sanitation commissioner was a familiar presence in Chicago's snow command, the overseer of a vast city department who arguably had more contact with city residents than any other official. After all, most citizens never have to call the police or fire department, but everyone expects their street to be plowed. "Remember me, and my track record and what I did for the city, and how I provided services to the city," he says. "I know people will judge me on my record as a public servant." He certainly needs to bank on those memories. Sanchez was convicted on a single count related to a hiring scheme, where prosecutors said jobs were steered to politically favored candidates. He doesn't shrink from his one-time role as the de facto head of the clout-heavy Hispanic Democratic Organization, which delivered thousands of votes for then-mayor Richard Daley. But he also says he did nothing wrong. "I had four thousand jobs," he says, of his Streets and Sanitation days. "They got me on one count, of a woman who didn't get hired to a part time job. This is the record. It's ridiculous!" "HDO represented political empowerment, it meant people got involved in the political process to make a better community," he says. "And if you elected a person like Rich Daley who understood that people of color and latinos should be part of his administration then so be it. I think everybody would want to be involved in that!" Sitting in a coffee shop in his south Chicago neighborhood, Sanchez calls himself a scapegoat for a political hiring system which had spanned decades in the city. "It doesn't rise to the level of criminality," he says. "Because if it did, these elected officials would be going to the joint!" "There's nothing wrong with making reccomendations. People make recommendations all the time…….as long as people are qualified!" Sanchez is one of five candidates vying for the seat of fourth district commissioner, including the incumbent, Stanley Moore. Another convicted felon, former alderman Isaac Carothers, is seeking the commissionership in the first district. For his part, the former Streets and San commissioner says he thinks the voters know he can deliver, and are willing to see past his conviction. "The point is, let me get out there and talk to people about what I want to do," he says. "They're going to say, 'How do we know you can do it?' Because I've done it! I've done it!"